I am extremely happy to announce that my husband, Dr. Jack Keshishyan, is joining our practice. Our goal has always been to provide the best possible Chiropractic care for our patients and their loved ones. With the addition of "Dr. Jack" we will be able to continue providing the same excellent care with more appointment times for you and your loved ones. He will also be expanding our treating hours on Mondays, Wednesdays and Fridays from 8:00 am to 5:45 pm, and be available for you on Saturdays from 9:00 am to 11:45 am. Dr. Jack will also be available on Tuesdays and Thursdays for new patient appointments, and emergency appointments. For the past 12 years, Dr. Jack has been practicing in Burbank. He ran a very successful practice specializing in sports injuries. While practicing in Burbank, Dr. Jack also volunteered as Burbank High School's Team Doctor for their football team. His interest in sports injuries began while playing high school football in Glendale. He also played college football at Glendale Community College before pursuing a short career of coaching high school football. 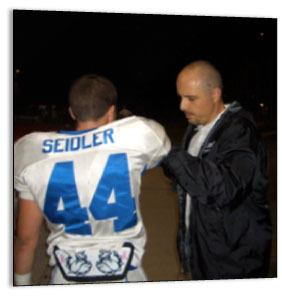 As a high school football player and coach he saw the benefits of Chiropractic care and decided to pursue it as a career. Dr. Jack also has experience treating complicated cases such as disc injuries, postural dysfunction, TMJ disorder, many different orthopedic injuries, pre-natal and pediatric Chiropractic care. I am sure that once you experience his treatment you will agree that we have the best Chiropractic team possible at Agoura Family Chiropractic. Dr. Jack and I first met in Chiropractic College in 1993. We were married in 1999 and we now have 2 beautiful children, Alexandra and Daniel. We always dreamed of opening a practice together, however following graduation we both were given separate opportunities. Now that our family has grown, we realize that being in the same practice is best for our family. For those of you who have not met Dr. Jack yet, we look forward to treating you and your loved ones in the near future. Thank you and God bless! Dr. Jack grew up in Glendale and became interested in chiropractic and physical therapy after a high school football injury to his low back. He graduated from Cleveland Chiropractic in 1996. Dr. Jack has a background in personal training and specializes in sports medicine, auto/work traumatic injuries, and injury prevention. He has experience in treating complicated cases such as disc injuries, postural dysfunction, TMJ disorder, many different orthopedic injuries, pre-natal and pediatric Chiropractic care. Specializing in Sports Injuries and Personal Injury Cases. Practice of Chiropractic including the following: Complete Physiotherapy, Massage Therapy and Exercise Rehabilitation, and Nutritional Counseling. Burbank High Athletic Trainer 1993 - 1995. Burbank High School Team Doctor, 1997 - 2010. 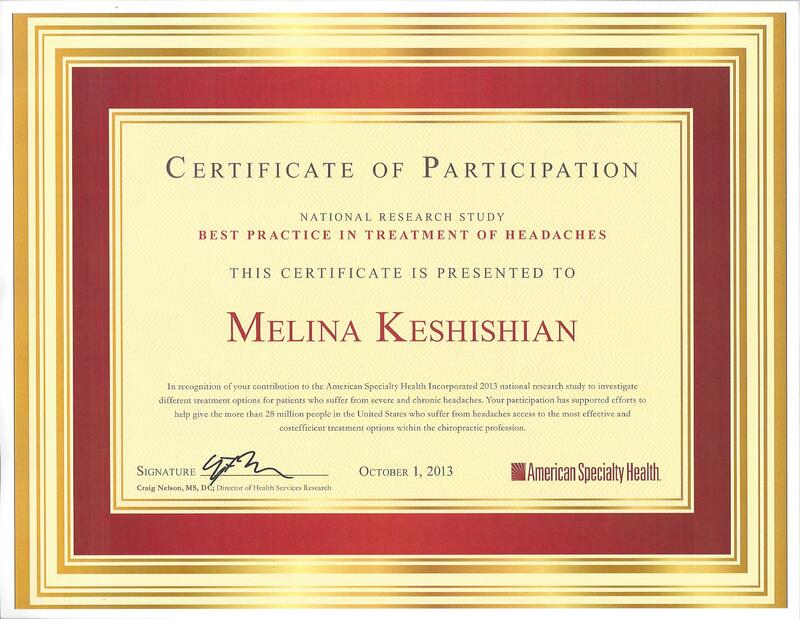 Dr. Melina Keshishian graduated from Cleveland Chiropractic College in 1996 and was the youngest graduate in her class. Her goals are very clear: to be an ongoing learned professional, practice Chiropractic very effectively, and to adhere to high ethical standards. 'Dr. K' treats individuals and families with many differing discomforts. Aside from treating back, shoulder, and arm pain, she has a special emphasis and interest in treating neck pain, tension headaches, and migraines. She also specializes in the care of children; as a mother of two, she understands the needs of children and can utilize the benefits of Chiropractic care to help them grow to their full potential. Furthermore, she is qualified to treat neck and back pain associated with pregnancy.